In Romans 15:3, the verse before this, Paul quotes Psalm 69:9 – “The insults of those who insult you have fallen on me.” And remarked in verse 4, whether in retrospect or in a sudden flash of inspiration, that everything that was written in the past was written to teach us and to ultimately encourage us and bring us hope. He was likely inspired as he quotes the old scriptures, but he certainly wasn’t just referring to Psalm 69:9, but the entirety to the Bible. Today, even Romans 15:4 itself is to us, something that was written long ago in the past, just like how the psalms were written in the past for the early church days. 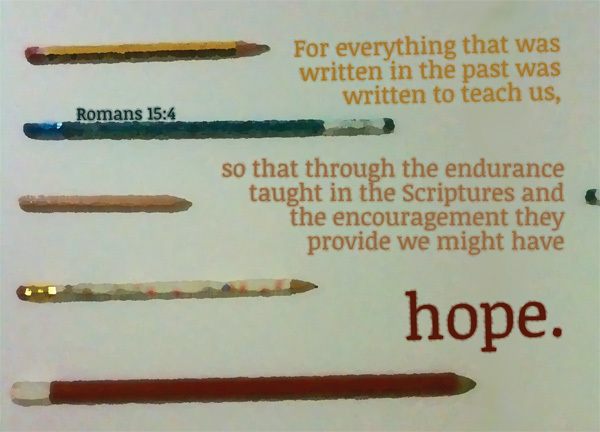 For us, whether the Old Testament or the New Testament, they were all written in the past – hence, this verse applies to every single verse in the Bible – they were written to teach us, so that through the endurance taught and the encouragement provided, we might have hope. For everything that was written in the past was written to teach us – In every time and era, there will probably be a select group of people who are against old teachings, considering them outdated and conservative. In the early church days, there were a lot of commotion about the conversion of Gentiles into the faith, and accommodating both Jews- with their numerous customs – and Gentiles – with their alien habits and beliefs, into the Church – especially in the church of Rome. Even till today, there are plenty of people who cannot accept some of the laws of the Old Testament, and claim it as out-dated and entirely redundant in this faith. Non-believers perhaps think that we are crazy for following the words of such an ancient book. We cannot assume that when Paul says ‘everything’, he refers to books and laws outside of the Bible – that would be too far and too unfair an assumption to make. These things happened to them as examples and were written down as warnings for us, on whom the culmination of the ages has come [1 Cor 10:11]. so that through the endurance taught in the Scriptures – In every time and era, there will be sufferings, there will be challenges, there will be difficulties in life itself – even if you are a Christian. In every time and era, there will be difficulties and trials for those who walk in the path of God’s precepts. Hence we need endurance. We need to persevere. And that sentiment is easily found in numerous places in the Bible, from the very beginning to very end. Even verses that simply praise the Lord’s greatness are also verses of endurance for us, reminding us that because our Lord is great and because he loves us, he will deliver us, he will be there for us. All Scripture is God-breathed and is useful for teaching, rebuking, correcting and training in righteousness [2 Tim 3:16]. and the encouragement they provide we might have hope – The Bible has a lot of commands, a lot of ‘Do’ this and that and a lot of ‘Do not’s. It has never considered that anyone or two of those commands are too difficult to us – even though I dare claim that in general most of them are rather hard. There is never any discouraging verses like, you should do this, but you will never be able to do it because you are hopeless – nothing quite in that mould. Yes, there were verses that speak of our worthlessness and our hopelessness, but even so, they are complemented with words of encouragement as we are told that despite being worthless and hopeless, we can draw strength from God – My comfort in my suffering is this: Your promise preserves my life [Psalm 119:50]. There are many many sad and dark passages in the Bible, where prophets talk about destruction and punishment and the downfall of men – but it is generally a trend of the style of writing amongst the books of the prophet that, everytime they discuss about some gloomy and dark scenario, they will always bring their readers back to hope by concluding something about God’s mercy – Though he brings grief, he will show compassion, so great is his unfailing love [Lam 3:32|Article] or something about, if you would only turn back to God, you will find him – ‘Return to me,’ declares the LordAlmighty, ‘and I will return to you,’ [Zech 1:3|Article], or something about God is always with us – The LORD your God is with you, he is mighty to save [Zeph 3:17|Article]. The people who truly knows how to appreciate hope are probably those who have once felt hopeless. Maybe we have never been in that kind of situation. That’s why the Bible is so precious. It tells us about the situations that our predecessors were in, without us having to go through it ourselves, so that we may learn a thing or two out of the lives of those who have tread on this path of faith before us. Admittedly, because the passages depict times that are thousands of years ago, some of the traditions and cultures and situations won’t really ever apply to us directly. Yet in whatever situation you are in, in whatever era we are in, everybody needs hope. And that’s what our Lord represents. That’s what the word of God gives us. Hope. Sometimes I wonder, did the writers of the Bible, especially in the Old Testament, ever imagined that several thousands of years later, people will still be reading what they wrote, in all kinds of languages and in all kinds of interpretations? Sometimes I wonder if the likes of Moses and Isaiah, or even Paul would be pissed off if they knew how some of us are interpreting what they wrote. Well, since all scriptures are breathed by God [2 Tim 3:16], I guess they won’t be pissed, as the interpretation still depends on the reader itself. Every time I come across Psalm 102:18, I am hit so hard by the power of the words that goosebumps would appear – Let this be written for a future generation, that a people not yet created may praise the LORD. I doubt any of the writers of the Bible really understood what they were doing – yes, they were writing for a future generation, for people yet created, but really, they wouldn’t have known that today what they write are so easily accessible to us in so many languages so many forms, so many exegeses, so many guides – we can have it on our phones, we can have it in our pockets. And this is thousands of years after their time. The same hope still spreads on, through the same words of God, which remain constant. Amazing, isn’t it? I shudder to imagine the people after my time – who knows how long more this world has? It could be very, very long yet. And this same hope we’re talking about today will still be present, because this same scripture will not die yet.